ArabSaga: Is the Arab League's Nabil Elaraby a quisling? The gutsy question referring to the head of the Arab League is raised in the leading Saudi daily Asharq Alawsat by non-other than its chief editor, Tariq Alhomayed. On July 17, 2011, and in the wake of Elaraby's trip to Syria and the remarks he made after meeting with Bashar al-Assad, I wrote an article saying: "The Syrians were very quick to build on the remarks made by the new Arab League secretary-general, Nabil Elaraby, whose statements could not have been made by someone seasoned in politics." The 10-month old Syrian revolution has so far claimed some 7,000 lives. Thousands more are either detained or gone missing. But we’re back discussing Nabil Elaraby and his positions on Syria. 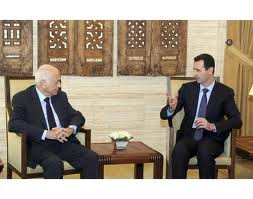 Mr. Elaraby defended Assad when he met with him in Damascus last July. He is fully aware nothing changed in the Syrian regime’s behavior since. Yet he persists in making odd and ambiguous decisions seemingly defending Assad. Even at his last press conference in Cairo, Elaraby did not sound convincing on the new Arab peace initiative. It was Sheikh Hamad bin Jassim who spoke rationally and plainly. Elaraby continues to sing out of tune. He chose Khaled Meshaal to relay a message to Assad, and Gen. al-Dabi to lead the Arab observer mission. He is now lobbying Egypt’s Mohamed ElBaradei to be his Syria envoy only because Assad could be more amenable to the appointment. That’s because of ElBaradei’s stands on the (2007) raid on Syria’s nuclear facility and on Iran’s nuclear program and his criticisms of the West and the Americans then. Is that a joke or a fact? With all due respect to ElBaradei, what would he do in Syria? Would he pull out as he did in Egypt (when he dropped his presidency bid)? Would he pass from sight when Syrian demonstrators come under fire as he stayed away from Tahrir Square, presumably not to steal the limelight from the youths there? All this is puzzling and warrants a legitimate query: So long as Elaraby chose Meshaal and al-Dabi and is now lining up ElBaradei, should we expect him to co-opt Azmi Bishara and Mohamed Hassanein Heikal next? To answer the question in the headline, Elaraby does not seem to be a quisling. But he is far from understanding the region and its variables. A quisling needs to be smarter for sure.